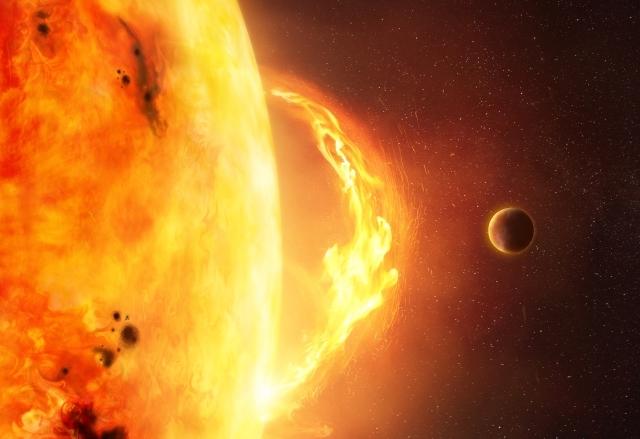 Space weather is just the environmental conditions in space that can have an effect on Earth. The most recognisable and visible of these is arguably the auroras (Northern and Southern Lights). However, as well as these spectacular natural phenomena, space weather also represents a real threat to our day-to-day life on earth; it can have an impact upon national infrastructure, technology, and communication systems. The Met Office ability to forecast space weather is dependent on the observations of the Sun that we receive from satellites in space. For terrestrial meteorology, we receive millions of observations, every hour, from ground-based equipment, satellites, aircraft and radiosondes. There are far fewer observations of the Sun’s activity. A mission to launch a spacecraft to gather new observations of the sun is underway. The L5 mission, championed by the UK Space Agency, gives us an opportunity to improve space weather forecasting. The Met Office is one of the organisations in the UK involved in the project. Having more observations will enable us to monitor the Sun for solar flares and coronal mass ejections (CMEs) more effectively. CMEs are large bursts of plasma from the surface of the sun and can reach the Earth in 18-96 hours, depending on speed and direction. They can result in geomagnetic storms that disrupt national power grids and global satellite and navigation networks. Why do observations from L5 matter? L5 refers to the 5th Lagrange point of the Sun-Earth gravitational system. 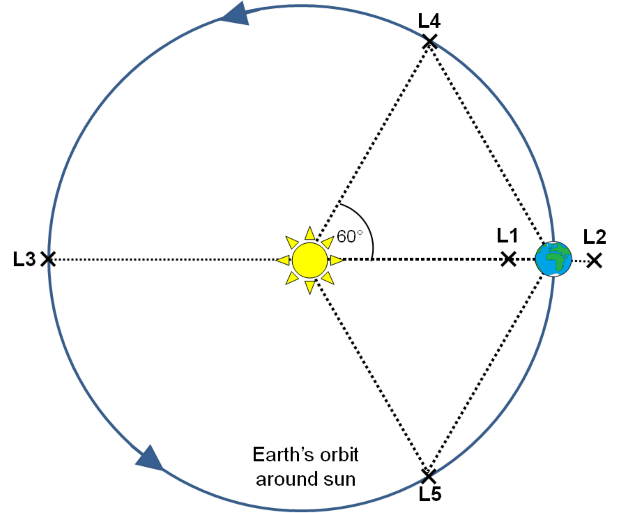 A Lagrange point is a point in space where the gravitational pull of two objects cancel out (in this case the Sun and Earth), resulting in gravitational equilibrium. Any spacecraft positioned at a Lagrange point would experience a stable orbit and remain in the same place relative to the Earth and Sun. 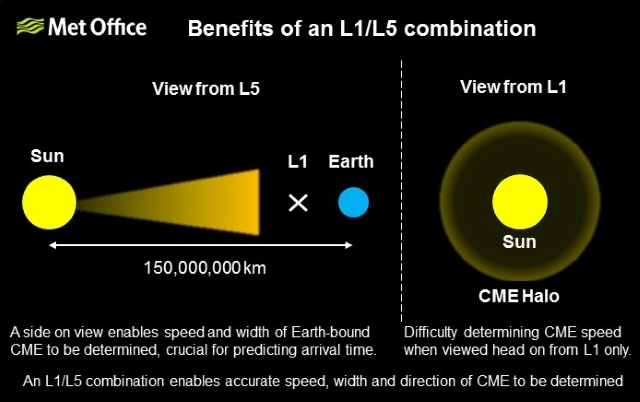 Currently the NOAA DSCOVR and NASA SOHO at the L1 point both provide observations for space weather forecasting, but additional observations from the L5 point would provide a unique perspective on the Sun-Earth system. Given the potential impacts, knowing when a CME will reach Earth is crucial for reducing the impact on national infrastructure. Currently, with the satellite imagery available, determining the direction, speed and width of a CME accurately is challenging. L5 observations would enable much better calculation of these factors and greatly increase the precision of CME arrival forecasting. It’s estimated a severe space weather event, could cost the UK as much as £4bn because of this it is on the Government’s National Risk Register. The cost of an event could be significantly reduced by more accurate forecasting. To support this aim, in 2016, the UK Space Agency committed €22 million, over 4 years, to ESA’s Space Situational Awareness (SSA) programme. This investment will support the UK’s growing space sector, which is a core part of the government’s Industrial Strategy, which aims to bring together the UK’s world-class research base with business investment, ensuring we continue to develop the technologies and industries of the future. Three out of four teams developing the platforms and instruments to support the European Space Agency (ESA) L5 mission are from the UK. Airbus UK will lead on developing the overall mission, with the focus on mission operations, the spacecraft platform, and on how this interfaces with the instruments. STFC RAL Space will lead the development of instruments to observe the sun and heliosphere and UCL Mullard Space Science Laboratory will lead the development of instruments to make measurements of the solar wind. OHB, from Germany, will lead the fourth consortium, aiming to develop a competing platform, with all proposals to be assessed by ESA. ESA is planning to select a final design for the spacecraft and its instruments based on the results of these studies, which are due in about 18 months. This entry was posted in Met Office News and tagged European Space Agency, Met Office, solar, solar cycle, solar storm, solar wind, space weather, Sun, sun spot, UK Space Agency, weather, weather forecasting. Bookmark the permalink.